Just be the best you can be doing whatever you do best! Don't worry about what other people do, just concentrate on what you do! Say please and thank you with a smile as often as possible. Seems to me these might be good goals for big people as well as those little girls don't you think? Now to this week's Keeping it simple project. I don't have any project instructions for these this week since I used a book for the instructions. But I will give you the designs that I made and the name of the book. 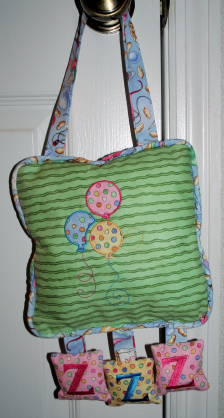 Both the door pillow and the grow chart were made using instructions from a book called A is Adorable by Janet Wecher-frisch. The fabric store had ruler ribbon that worked great for the grow chart. Then I just appliqued inside each block instead of fussy-cutting fabric pictures. If you get the book and like the animal alphabet the author designed you can see the Hungry Animal Alphabet Designs here. 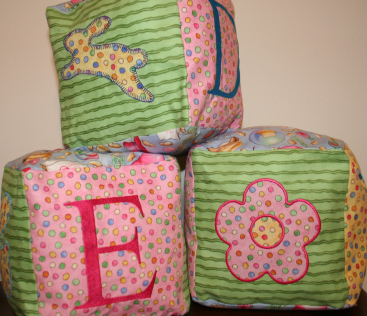 Here are some coordinating baby blocks that I made to go along with these. I will post the designs for these along with instructions for a new idea in my next blog. Whatever your resolutions and whether or not you are able to keep them I wish you a happy 2011.